SpongeBob SquarePants is a sponge who lives in a pineapple under the sea, while his octopus neighbor Squidward Tentacles lives in a moai head. SpongeBob's other neighbor and best friend (on the other side of Squidward), is a pink starfish named Patrick Star, who lives under a rock. Squidward always gets annoyed when SpongeBob and Patrick bother him. Angeles. Bikini Bottom is like a regular city with a downtown, suburbs, and coastal areas with its own airport, bus system, and fair park. Stephen Hillenburg said once that Bikini Bottom was loosely based on Seattle, Washington, one good example of this statement was that in the episode Prehibernation week Sandy and SpongeBob were Fighting on a tall structure called the sea aeedle referencing the Space Needle a tall structure in Seattle. Stephen said that he want to leave the location of Bikini Bottom to the peoples imagination claiming that the Baywatch scene was just a reference to his favorite show of all time. SpongeBob's house-pet is a snail named Gary, whose "meow" is similar to a cat. Although Gary only speaks in a few episodes, the characters have shown an ability to understand him. In addition to this, underwater worms bark exactly like dogs, and are kept on chains. Jellyfish are the equivalent of bees; buzzing, stinging with poison although appears to be an electric shock, and producing delicious "jelly", mocking the name "jellyfish", while still referencing a bee's honey. Fish act as the citizens of the community but, as a rule, are not important characters. SpongeBob, who is absorbent, yellow and porous, works as a fry cook at the Krusty Krab, a hamburger fast-food restaurant, with Squidward who is the cashier. The Krusty Krab is owned by Eugene H. Krabs, also known as Mr. Krabs. Sheldon J. Plankton (commonly referred to as "Plankton") is Mr. Krabs' arch enemy who owns a low-rank fast-food restaurant called The Chum Bucket across the street which has never had a customer, and he spends most of his time plotting to steal the recipe for Mr. Krabs's popular Krabby Patty burgers. Only in the movie does he succeed; the formula is never actually revealed to the audience. Plankton's computer wife, Karen, alternately helps him in his schemes or bickers with him. 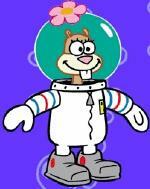 Sandy Cheeks is another friend of SpongeBob. She is a squirrel that lives in an underwater dome in Bikini Bottom. She was sent there by her bosses, chimpanzees. Sandy has a Texan accent and is from the state itself. When not inside her tree-dome, she wears an astronaut suit. Sandy, just like a normal squirrel, hibernates once a year, as seen in a few episodes such as Prehibernation Week and Survival Of The Idiots. Instead of cars, the residents of Bikini Bottom drive boats. SpongeBob is still in boating school after failing the driving test several times. Once, during an episode set in a wilderness area, Patrick questions how a camp fire is possible on the lagoon bottom. As soon as the question is asked, the fire is immediately extinguished with a sizzle. A flurry of bubbles accompanies actions in many of the episodes to remind the viewer that the setting is underwater. Ironically, when there is a separate body of water underwater, such as a swimming pool or lagoon, a non-car boat must be used to cross it because both SpongeBob and Patrick cannot swim, they must be taught by Larry the Lobster. SpongeBob is the only cartoon to consistently make the Top 10 list in the Nielsen ratings, and is the first "low budget" Nickelodeon cartoon, according to the network, to become extremely popular. Low-budget cartoons had not garnered as much esteem as higher-rated (and higher-budgeted) shows, such as Rugrats, although when SpongeBob aired in 1999, it had gained a significant enough number of viewers in the ratings to be considered popular, eventually becoming more popular than Rugrats had ever been. SpongeBob follows other Nickelodeon shows that have attracted "older" followers: The Ren & Stimpy Show, Rocko's Modern Life, the Kablam! skits, Action League Now! and The Angry Beavers. Other shows have followed in this trend as well: Invader Zim and The Fairly OddParents won a similar fan base when they aired in 2001, and the latter is now second only to SpongeBob in popularity, while the former attracted a cult following. The show debuted in 1999, and during that time, Pokémon was still the biggest craze. SpongeBob did not gain its popularity until around 2000, and it has remained popular since then.